Today was the first day of intake for the upcoming Ancestors show in Belmar. I had filled out my form with some of the family story, and brought that, the artifact, and my framed woodcut to the Boatworks in the early afternoon. After I signed in with my artwork, Louise showed me the plan for my works (I guess she had gotten word from Diane on what I was bringing). 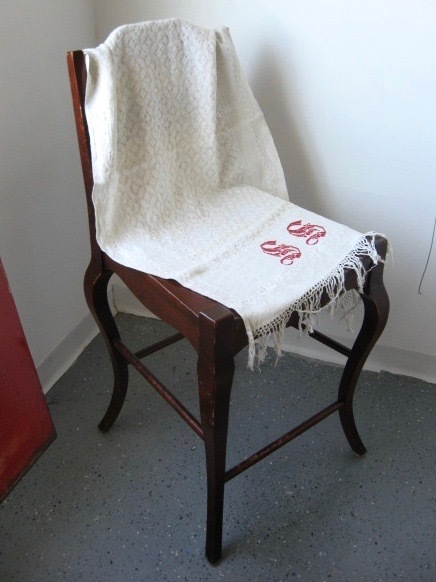 As of this afternoon, the plan called for my framed woodcut to be hung in the front room, and the artifact (a sewn and embroidered cloth with giant initials on it) to be draped over a tall wooden chair/stool that will sit in front of (and under) the framed piece. She showed me what she had in mind. 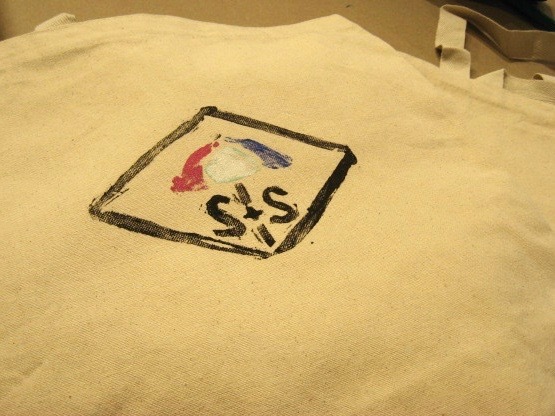 One thing I quickly realized is that my artifact has the advantage of the initials on it being SS, which reads the same both right side up and upside down, so no matter how they drape the cloth, it will make sense. I turned in the written information, which will be turned into a card to be posted on the wall near the piece, so all that information will be available at all times. Right now the Boatworks is still officially closed for cleaning, so this exhibition will finally open to the public on July 5, 2018, and the official reception will be on Saturday July 14, 2018 from 5 to 7 pm. The current plan also calls for artists to do some kind of presentation of their stuff, around 6 pm, kind of like the Salon shows, but I can easily tell the story, so no problem. Last night I sent an e-mail to the office at Belmar, requesting clarification as to when they would be open, both to finally pay my entry fee, and also to get more information regarding the presentation of the artifact part of the show. Finally received a response this morning from Diane, our new director, saying she'd be there until around 2 pm. That freed up my morning for other purposes, including picking up my artifact from my parents' house. I knew it would be one of the very old embroidered pieces of cloth that my grandmother had, and had now passed into my mother's possession. When I filled out the application form, I just gave a vague description of hand embroidered cloth from an ancestor, not sure which one I'd be using. 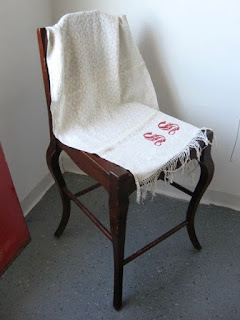 My mother pushed me to go with the most elaborate one, lots of stitching, lots of fringe, and two big initials on it, those of the piece's creator. Seems like the best choice. Early this afternoon I made it to Belmar and found Diane there. Paid my fee, got a receipt, so that's now all taken care of. When I asked about rules and methods of presenting the artifacts, she told me to just bring it in on the day we deliver our artwork, and it would be up to show co-curator Louise to decide. Said she has lots of ideas and plans, so I'll see what she comes up this weekend. Diane also gave me a form that will eventually go to all the artists, with a space to fill out a description of the object and its relation ship to us and artwork. There are stories to go with all this, so now they will be known to all who visit the show. With all that taken care of, we had time to talk about my upcoming class. First thing I wanted to thank her for the big press release/article, which I credit for at least some of the good response my class got. Earlier I had no students, and after the article I had a full class. I got the impression that the size of the article and the illustration was not her idea, so I guess it was the paper's doing (slow news week maybe.) I looked over the list of signed up students, and none seemed to be names I knew, so I guess no previous students. One story she shared was that it started filling so quickly, that when one person signed up she said she'd have to check to see if the limit had been reached yet; this new person got the last spot and was very excited, almost like she won some kind of prize. No, just the prize of getting to make woodcuts, which anyone can do. Diane has no problem with my 6 person cap, and even seemed surprised I could handle that many. With a bigger room I could have more people working, but it's a little dangerous if the room is crowded with people and very sharp tools, and when everyone wants to print at once, there is your big challenge. I have a few weeks left to get ready for it. A few months back I learned about a coming show at BelmarArts, one called Ancestors. The inspiration (I was told) was a member having some quilts made by an elderly relative and he was looking for a way to show them. What we ended up with was an exhibition that would feature artwork related in some way to our ancestors, and we had the option of showing alongside it something created by or involving some related ancestors. Not one of my big topics, but my parents reminded me I had some work that fit the bill, and we could probably find something for the ancestor part. I gathered more details as the dates drew closer. One thing was kind of in front of me the whole time. 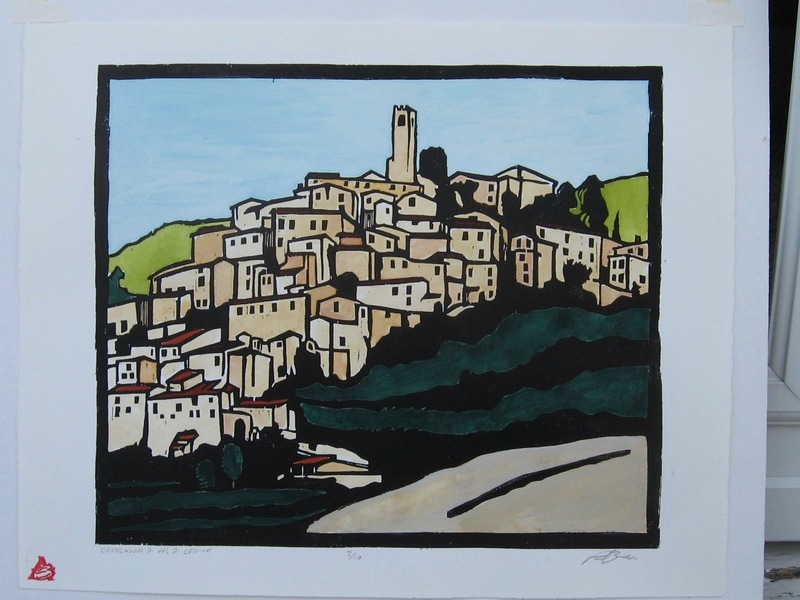 A while back I had produced a landscape piece featuring a view of Castelnuovo Di Val Di Cecina, a small mountain town in Tuscany. I don't remember if there was a specific reason I decided to do it. It's certainly a nice scene, an aesthetically pleasing composition. Had plenty of images to work from, between photos taken by myself, immediate family, and distant cousins, since this is a town that has a significant place in my ancestral line. This was the hometown of one of my great grandfathers, and I still have relatives living there. I don't know if any of them live in the part of town depicted here, the 13th century hillside of stone that crawls over the hill. The ones I met were all from within a short walk of this scene, a more modern section, though I was shown the original one room space as well. This image combines bits of multiple photos, and is a bit simplified, but captures the general appearance. It was carved as a woodcut, printed with black ink, and then hand colored with watercolor. This particular proof was made, mounted and framed, and was given to my grandfather, who I was traveling with the first time I saw the place, and whose father had once lived there. When my grandparents decided to move back to New Jersey, it came back with them, and eventually ended up hanging in my parents' living room. As far as something really old, my mother remembered that she had some very old hand made cloth items that she had gotten from her mother, which had originated with people of this town. So this could be done. The next step was the application process. Years ago, Belmar switched to a digital process, where we submit information and a digital image over the internet, which can save a lot of time and space compared to the old fashioned drop off days that galleries required in the old days. The problem was that I had no digital images of this print. The only photo I had was a 35mm slide, which was the ideal form of recording things back in the last century when I made it, and I have no idea where the block is. The only copy is that framed one, so yesterday while I was waiting for the lawnmower battery to recharge, I took apart the frame and shot digital images of the woodcut. (shooting through glass is almost impossible- the dark areas of the print act as mirrors and you get weird glares all over the place) The other issue is that the new people running things in Belmar have changed some of the rules we always had, adding specifics to the submitted digital images. Maximum file size was easy, and maximum pixel length was handled with a camera function and editing the photo on my computer. The request for a specific DPI (dots per inch) made no sense, as it is a term relating to printing on paper and this image will be submitted digitally and viewed on a monitor screen. Anyway, it's not something I can adjust on either my camera or my computer. Downloaded and edited a photo yesterday (the one you see above) that seemed to suit my needs. Got an e-mail last night saying that they had decided to push the deadline back from tonight to tomorrow night, and that the gallery would be closed this week for "cleaning", but the office would be open, except when it's not, and no word as to when that would be. 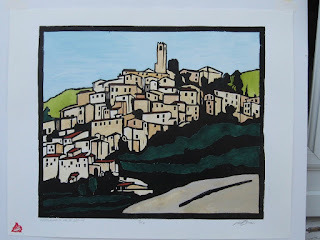 So earlier this morning I remounted the piece in the frame (new linen tape hinges and framer's points needed, an in the afternoon I completed the digital application, including uploading my edited photo of the Castelnuovo woodcut, and submitted it. But I still have questions about presentation of the artifact, plus I usually hand in the exhibition fee in person, but when I stopped by today during office hours, the place was dark and locked- no one in the office, and no one cleaning. Luckily we got that extension, so perhaps tomorrow I can stop by and this will all be done. During the day I was at my parents' house, and looked through the issue of the Coast Star that arrived today. 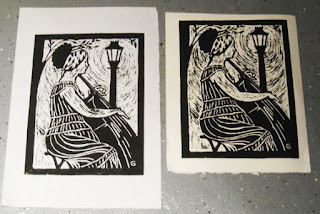 One notable thing was a large article about my upcoming woodcut class in Belmar. Last time I just was a mention in a whole list of Belmar activities. The text was pretty much from my faculty page on the BelmarArts website, but I wrote that so it's all good stuff. The article included an illustration, which ended up being one of the examples of student work from the class that I have on the workshop page this time around. What was chosen was the side by side images of two proofs of Mary Lane's portrait of a woman playing a large instrument (cello or something of that nature), from 2012. I had to come up with some images quickly, so went to my folder of workshop photos and chose 3 examples that I thought showed common approaches and possibilities that might spark some interest- Mary's very balanced black and white figure image, a color image made from multiple blocks carefully registered, and a complex image printed on a piece of scrapbooking paper that also included images/patterns and colors, leading to a more elaborate composition. I don't know who chose the image for this article- it could have been sent out by our office, or may have been downloaded by the newspaper to fill some space. (both are common in newspaper publishing) It's a good image, and the kind of thing that might cause a visual artist to want to try a woodcut. The one negative is that I hadn't included art credits for me or Mary on the original page, so naturally there aren't any for us here either. But if it gets people to sign up for the class, that's enough for me. The first time I ever taught a linocut class was a workshop in the Studio, part of the Creativity by the Sea festival in Ocean Grove. The linocut tools that I have go back to this event, though I also used them to take 2nd place in a pumpkin carving contest in Belmar, and one time that I used a piece of linoleum to substitute for an incorrectly cut part of a boardwalk print. But otherwise they sat in a wooden cigar box locked in my small cabinet, until I got them out a few weeks ago to see what I had. The occasion was that suddenly I had multiple requests to teach linoleum cutting classes this summer and wanted to see what tools and materials I had in my possession. The first class was tonight, at the Creativity Lab in Belmar. This brand new business is up on Main Street, just a few doors down from Pyanoe Plaza and Don's King of Pizza. 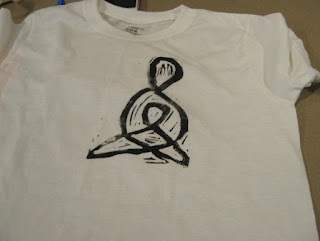 Owner Lauren recruited me after seeing my woodcut class on the BelmarArts site. By day this place will mostly be occupied by kids, and there are plenty of classes and workshops with them in mind, especially with an emphasis on technical stuff. They build and program simple robots, do some 3D printing and things like that that are popular with parents and schools these days. (check the above link to see more) At night it's all adults and alcohol is freely shared. I use computers plenty in my own life (such as this blog), but for art I tend to prefer an old fashioned approach, as do those people who take my woodcut classes. Unfortunately, tonight was to be only a one night workshop, which doesn't work for woodcut, which is why I had suggest linoleum. No experienced printmakers in the class, but they all seemed excited to get started. I did make them sit though a quick safety lecture, which worked well with Lauren getting some bandaids across the street while we were waiting for a few late arrivals. During yesterday's test cutting and printing she ended up cutting herself while cutting the linoleum, despite (as she confessed to the class tonight) I had repeatedly warned her not to do what she was doing. Just a minor cut- she's fine now. But then we got to work. She had been expecting 8, but 2 couldn't make it, which was probably for the best as the six we had kept me hopping. Most of the chosen designs came from the web, so mostly I advised on how to convert them to simple monochromatic designs and demonstrated the best ways to use the tools and cut the material. The participants all figured it out quickly and soon were ready to cut and print what they had. Lauren and provided small tote bags, but some had brought in t-shirts as well. Lauren and been looking at examples of patterns, and some of the participants decided to try such things themselves. The above artist chose the leaf shape, which I showed here how to cut, and mixed a color she requested. I had also demonstrated how masking tape could be used to cover large negative spaces and cover up trace ink marks. 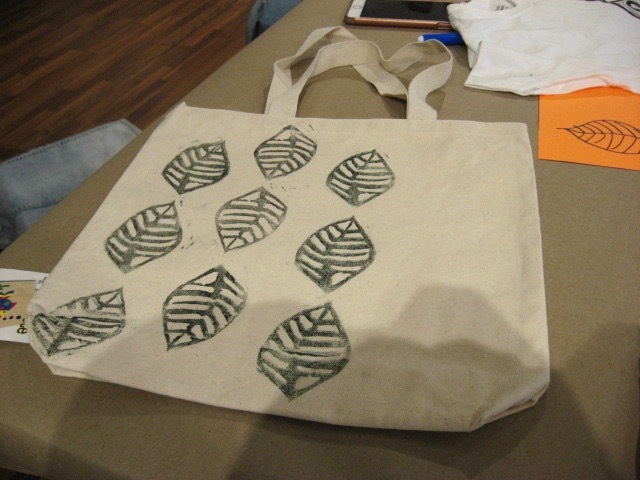 But she took it from there, and before I knew what was happening, this artist was covering a tote bag with a leaf pattern. Eventually another column of 3 would fill that space on the right. Meanwhile, another participant wanted a more multicolor design, so after cutting down all the negative space in her design, I lent her a brush so she could paint each raised section with individual colors, and my instructions on backwards lettering were followed. She liked the results so much, that she reinked her linoleum and printed a second one. Everyone seemed to be happy with what they did and had a good time. Lauren seemed like she thought it a success as well, and we are likely to do more things like this. When I know more, I'll post it here. We're now almost a month past the end of the spring college semester. As of now, I am pencilled in by my university to teach again in the fall, but that is still months away. When college classes end, the college checks stop coming, too. No surprise there. But it's why I spend part of every summer looking for some kind of summer work. The past 3 summers I had various summer jobs, each of which I kept going well into the fall, ending them when they started taking time away from my college work, which is pretty much what paid my bills. Summer jobs typically pay around minimum wage, which isn't even close to what one needs to live on. I took advantage of having no other commitments to pick up extra shifts, sometimes getting close to 40 hours/week, what one might call full time if employers ever hired full time employees, but even those long weeks I couldn't earn enough to pay rent, much less my other fixed expenses, so that kind of work is a dead end. Which doesn't mean I haven't submitted some applications and won't do more of them. But so far this summer I have been concentrating on teaching art. First of all, it is something that I'm actually good at. Been doing it for decades, and have done it in lots of places. Second, it's just part time, but it pays far better than most part time jobs. But you don't get paid for all of it. One has to spend a lot of time on things related to the job that have nothing to do with teaching art. 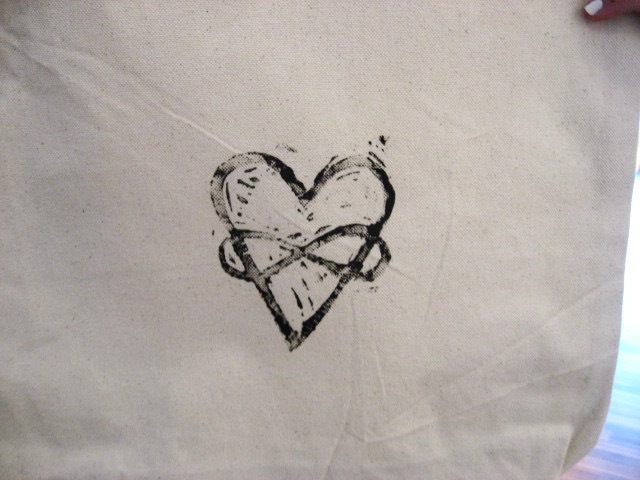 Right now I have three part time relief printing teaching situations progressing forwards. The longest established is the BelmarArts woodcut class, which I have taught many times, including a series that I just finished recently. The next one starts up again in about a month, pending people actually signing up for the class. It's been on the web for at least a few weeks, and an e-mail blast to members went out a few days ago, but even before that I was sending e-mails to individuals who had taken the class before, or who had expressed an interest but couldn't sign up in the past, just letting them know it was out there if they were interested in another go, or knew someone who admired what they did and might want to try it themselves. Don't know if anything will come from these recent contacts, but getting the word out is part of the job. Meanwhile two other jobs seem to be directly related to the existence of the first one, as it seems to be how they found me. I am scheduled to teach a one day workshop in linoleum printing for high school age students at a library in Ocean County in August. (I figure lino is a lot safer than wood for inexperienced students) The initial plan was set up a few weeks ago, but getting it official has been delayed by paperwork. I stand to make more for one afternoon than I would in a whole week at a typical summer job, but only if I can get my vendor license straightened out so I can be paid. It's a online process, but does require being given a special password from a county employee, and that employee had been out sick the first few days this week. Hours spent on the computer and on the phone that accomplished nothing. But the missing person was back today, so that class is on as of now. The other class is close to home, in Belmar, just a few blocks from the place I have taught before. Again, linoleum and a one day class, but this time adults, and if it works, there will be more of these scheduled, or my expertise may be turned to other types of art. This place just opened a week ago and things are being figured out, so I decided it would be good to go there before the class and show exactly what we can do. Lauren, the owner/operator was there today and so I came by with one of my collection of tools and other materials, so she could see what is involved. (she's into a lot of high-tech stuff, so there are workshops for 3D printing, building robots, etc) So today was not paid work, and it won't affect the plan for tomorrow's scheduled class, but it could pay off in the future. Because I did show her how to cut and print a small linocut (demonstrating teaching skill) and she found it to be really fun and the resulting print to be very cute (making it easier to sell the class to future students). Paying work begins tomorrow night, but I'm hoping more classes will follow, and if the first print class goes well, I'm pretty sure more will be scheduled.